What he meant: Actually you will be able to save up to £20,000 but the bonus will only apply to £4,000. 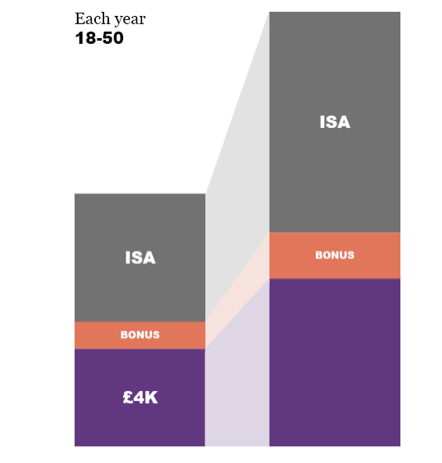 A Lifetime Isa (Lisa) can be taken out by anyone aged between age 18 and 40, however contributions may be made by anyone. At the end of the tax year a bonus equal to 25 per cent of the contributions made in that year will be paid in by the Government. The size of the fund (after investment) does not affect this in any way and in years where no contributions are made no bonus will be paid. Planning point: It is worth considering the timing of contributions. Lump-sum contributions made just before the end of the tax year will see a very quick increase in the value of their fund which may impress some of your clients no end! The exception is with Help to Buy Isas (Hisas). There is a one-off opportunity to transfer any pre-6 April Hisa savings into a Lisa during the 2017/18 tax year, and these savings will count towards the bonus for that year even if they exceed the £4,000 limit. Savings made into a Hisa after 6 April will also count but only if the total of these savings, together with any saving made into the Lisa does not exceed £4,000. Planning point: Clients, or children of clients, who are the appropriate age could effectively start contributing to a Lisa now by investing in a Hisa and then transferring soon after 6 April. Individuals who are aged 40 or over on 6 April 2017 will not be able to open a Lisa. Anyone turning 40 in tax year 2017/18 will be able to open a Lisa before turning 40 and will receive the benefit of the bonus up to age 50. Planning point: Contact clients who will reach age 40 in 2017/8 as a priority. What he meant: We’ve put off the choice between saving for your first home, or saving for your retirement. Withdrawals made to fund the purchase of the saver’s first UK residence will be tax-free. This means if the money is used for a buy-to-let purchase or an overseas residence it will suffer the exit penalty. Couples who are buying their first home together may use both of their Lisa plans so long as neither has previously owned a property. If one of them already has a property they can still use the Lisa funds but they will suffer the penalty. Savers can also access their money tax-free if they withdraw them after age 60. There are no minimum or maximum limits and no restrictions on the speed or frequency with which withdrawals must be made. 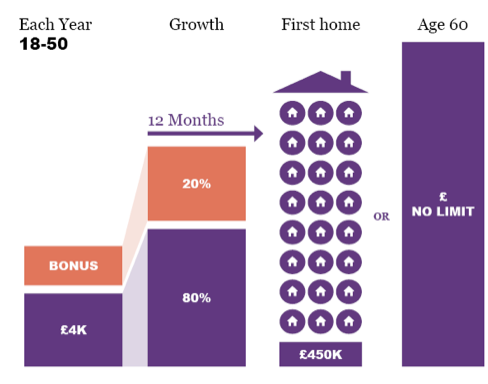 The problem is that young savers who really can’t afford to save into both a Lisa and a pension are only putting the decision off until they actually purchase their first home. At that point if they choose to use the proceeds of their Lisa to buy a property they will have to start again if they want to save for their retirement. Of course they will already be used to saving and will also own an asset which could potentially be used to fund their retirement, which is more than they might have had without Lisa. Planning point: Contact clients who have children/grandchildren in the relevant age group. It would be possible for them to fund Lisa savings while the child funds pensions savings. going to consult on possible additional access points. What he meant: We’re applying an exit penalty . Unlike a pension it will not be illegal to access Lisa savings before the minimum age limit, and this could be very attractive to some savers, especially younger clients and the self-employed. Tim saves £4,000 into a Lifetime Isa and gets a £1,000 bonus. After some years, this had grown to £10,000. Tim withdraws £5,000.00. He forgoes the Government bonus portion, which is 20 per cent (£1,000). The total charge is £1,250, or 25 per cent of the withdrawal. This is why if contributions above £4,000 are allowed it may be advantageous to hold a segregated plan. 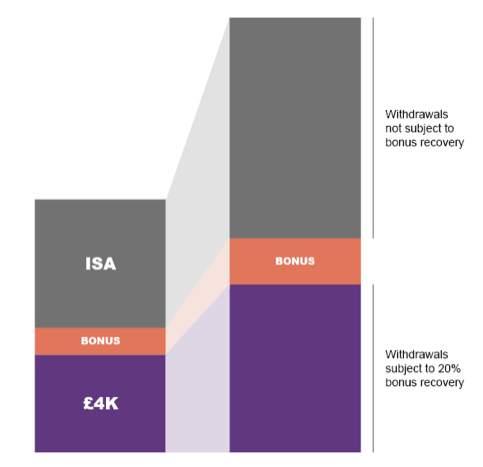 Since the bonus only applies to part of the plan, it would be preferable to make withdrawals only from the part of the plan that did not receive any bonus. That being the case the Lisa provider would have to be able to separately identify that part of the fund. Planning point: Clients looking to access their Lisa funds should be encouraged to use any other investments first. to encourage people to keep their money invested, of course.